Dutch iris bulbs demand two things to grow and bloom well: sunshine and good drainage. If you have a sunny window, you can easily grow these magnificent flowers in your home. Unlike the most irises, Dutch irises grow from bulbs, not rhizomes, making them an excellent choice for forcing. Tall, upright stems and silky, delicate blooms lend elegant beauty wherever you display them. The flowers can grow up to 4 inches (10 cm) across are available in a rich rainbow of colors -- blue, violet, white, yellow and bicolors. Many Dutch iris varieties are available to choose from...'Professor Blaauw' pale blue petals with a bright yellow stripe...'Blue Pearl' blooms are deep violet-blue... 'Discovery' is one of the most popular in brilliant blue with a golden-yellow lip...and rare 'Eye of the Tiger' is dramatic with purple and dark-red petals. You'll find good-quality bulbs for sale at garden centers and online nurseries that specialize in flower bulbs. Buy Dutch iris bulbs that are firm -- not soft or mushy. Don't buy any that are sprouting. Dutch irises need a cold treatment for 8 weeks. Start the process in October or November for mid-winter blooms. Choose a shallow pot (at least 3 in/7 cm deep) with drainage holes in the bottom. Fill the pot loosely with potting mix. Set several bulbs side by side -- close but not touching -- pointed end up. Set bulbs so that their tips are even with pot rim. Top with additional potting mix until just barely covered. Water thoroughly and empty drainage saucer. Move pot to a dark, cool, but not freezing, (35-45°F/2-7°C) location such as a basement, unheated garage or refrigerator. Avoid storing bulbs near ripening fruit or vegetables because the ethylene gas they produce can damage them. Keep them in cold storage for about 8 weeks. Keep the medium barely moist. When shoots reach about 2 in (5 cm) tall, bring the pot out of cold storage and place it in a warmer (60°F/16°C) location with low light intensity. Over the next few days, gradually move it toward a sunny window. Turn the pot every day for even growth. When in full bloom, keep irises in a sunny location. Water: Water sparingly until growth appears, then water enough to keep soil evenly moist. Soggy soil will cause bulbs to rot. Temperature: After the cold treatment (see "how to force" above), cool to average 60-65°F/10-18°C. Iris blooms will last longer if kept at a maximum of 65°F/18°C. Propagation: Irises cannot be forced a second time indoors. If you want to keep them, allow the foliage to die back naturally, then store them in a cool, dry place. Plant the bulbs in a sunny spot in your flower garden in the fall. 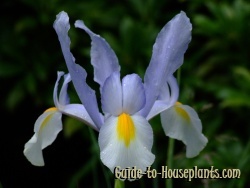 Dutch irises are hardy to Zone 5 and naturally bloom in early summer. Dutch iris bulbs multiply rapidly, so you'll enjoy a profusion of these captivating irises.